Let me just say, off the bat, that whilst I am familiar with a few different types and models of modern combat optics, I am by no means an expert. That said, I have bumped into a few photos from the recent Libyan conflict that have raised an eyebrow, so I though I would collate them here. This rebel fighter is holding an AK-103 (likely an AK-103-2, as discussed here) with what appears to be a Belarusian PK-01 series collimating (‘red dot’) weapon sight. It appears to be one of the latest PK-01VS models produced by LEMT, as seen on their website here. Photo via MilitaryPhotos.net (original source unlisted). UPDATE 02/12/2011: Thanks to a reader for pointing out that LEMT sights are actually manufactured in Belarus, not Russia. 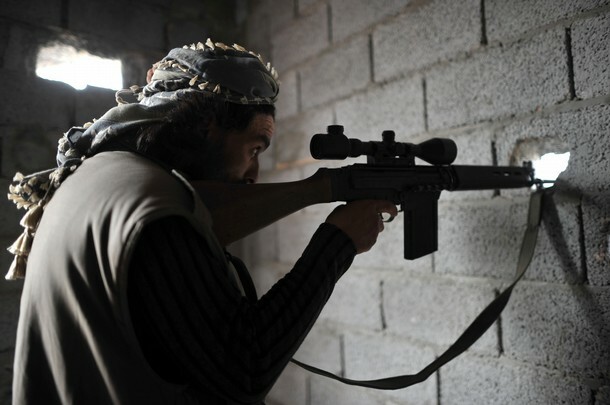 This picture shows a rebel sniper/counter-sniper with an FAL fitted with a commercial hunting scope. 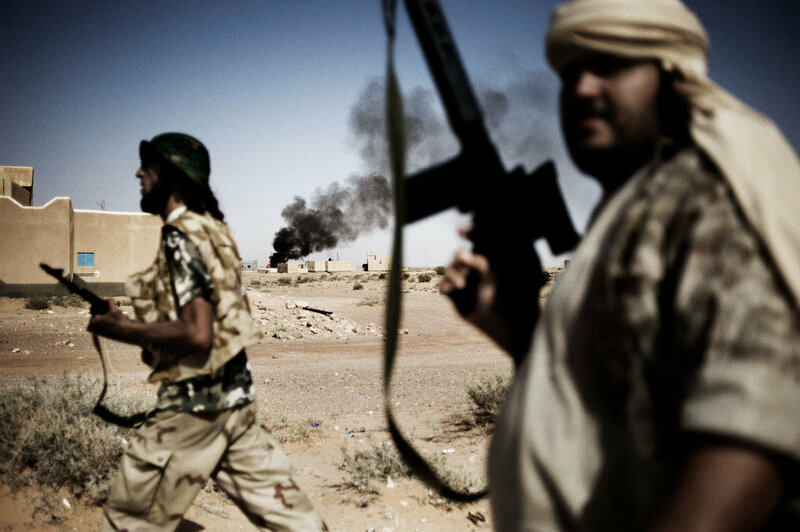 Reports have referred to Libyan rebels using Bushnell telescopic sights. UPDATE 02/12/2011: Another photo here shows a scope that appears to be the same. These look as if they may be Bushnell ‘Banner’ series sights. 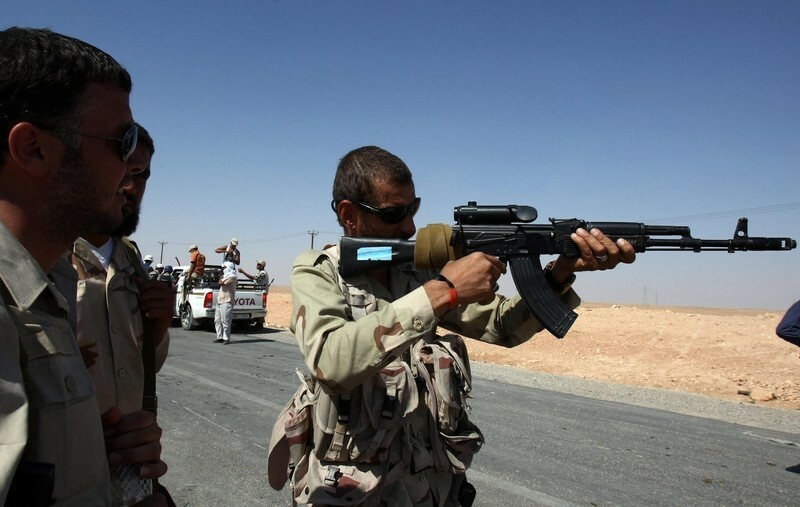 This image shows another AK-103, this time fitted with what appears to be an Advanced Combat Optical Gunsight (ACOG). I’m not sure on the model, and it is also possible that it is a cheap knock-off as there are many of those readily available. There is also an interesting suppressed Beretta, but that is for another post! If anyone has any other pictures of optics from the Libyan conflict, or can shed any more light on the photos shown here, please get in contact with me. That is a PK-01VP up top. As you can see they are noticeably different. That last photo which states a C79 scope, it actually looks like a wildcat or EOS ( enhanced optic sight). As used by he Australian army as an optional sight. The ‘Wildcat’ is another name for the ELCAN C79 (Canadian designation), but good spotto anyhow. I believe the actual ‘product name’ is the SpecterOS 3.4x, but I’m not sure if that is still current. I’m liking the Beretta (M1934 I believe) with the suppressor in the FAL+ACOG photo. AK-103+ACOG, but yes, you’re correct in IDing it as an M1934. Ah yes, I’m not sure how I caught the 1934 but wrongly identified the AK on my phone :P.
That’s my best guess on it too.